Just as much of the emphasis of the political discourse in Washington has been on the economy of late, a great deal of our investment decisions is influenced by our views on both the current state of the economy and our forecast for future economic growth. According to the Center on Budget and Policy Priorities, the U.S. economy has grown for twelve consecutive quarters, but the pace of the growth has been slow and below historical economic recovery averages. 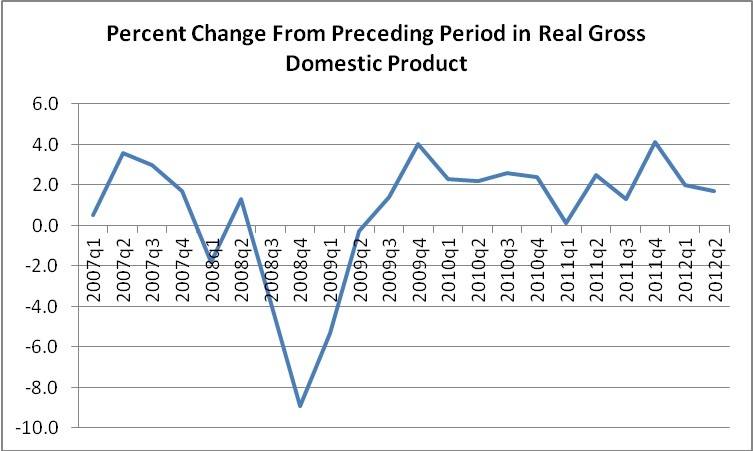 Evidence of this slow growth can be found in the paltry 1.3% revised Gross Domestic Product (GDP) annualized growth rate for the 2nd quarter of 2012. Of further concern to us at Hennion & Walsh, with respect to economic growth, is the impending “Fiscal Cliff” and the accompanying decisions on taxes and spending that are likely to place in the halls of Congress. Some have estimated that a 4% drag on GDP may take place depending on the outcome of these decisions…4% that the economy cannot afford to lose! Absent the outcome of the Fiscal Cliff debates/negotiations, we do not believe that there is a high probability of the economy falling back into recession (which we still define as two consecutive quarters of negative GDP growth) at this point in time as we have taken notice of positive trends in the housing and jobs markets – and a recently reported 3rd quarter 2012 GDP increased annual rate of 2.7%. We have, however, come to the realization that the “new norm” as it relates to economic growth, as measured by GDP, in the United States may fall within the grinding range of 2.2% – 2-8% for the next couple of years. Others have suggested that this “new norm” may last even longer. 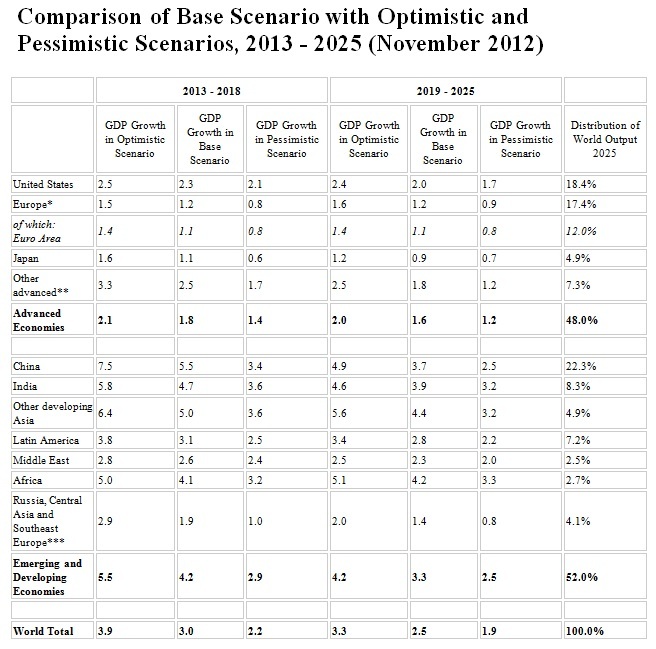 For example, the Conference Board in the November 2012 Global Outlook (see chart below) forecasted an annualized growth rate of 2.3% in their base case for the years 2013-2018 and a further reduced annualized growth rate projection of 2.0% in their base case for the years 2019-2025, representing a distribution of roughly 18% of overall World output.